This property is directly associated with the initial period (1902-1920) of downtown commercial expansion that occurred due to local economic prosperity after the Klondike Gold Rush and in tandem with explosive population growth and suburban neighborhood development. During this era, modern downtown urban scale began with the construction of the earliest steel-frame highrise buildings and the establishment of a concentration of banking enterprises and department stores along Second Avenue from Cherry Street to Pike Street. The initial regrading of Denny Hill and the commercial redevelopment of the former University Grounds (University/Metropolitan Tract) were major factors that facilitated northward and eastward commercial expansion. In 1914, the owners of the Frederick and Nelson Department Store purchased property with the intention of building a large, five-story store at Fifth Avenue and Pine Street, thus solidifying the location of the future downtown retail core. A significant number of extant commercial properties dating from this era remain within the downtown commercial core, including: numerous hotels, banks, business blocks and early highrise commercial buildings, as well as some specialty and department stores, clubhouses, apartment houses and theaters. After the turn of the century, local and regional economic prosperity generated the earliest construction of tall, steel-frame and ferroconcrete office buildings at the northern edge of the commercial district along Second Avenue. The 14-story Alaska Building (1903-04), the 12-story American Savings Bank/Empire Building (1904-06, destroyed), and the not fully realized 12-story Mehlorn Building (1906-07) were constructed exhibiting elegant brick and terra cotta cladding and ornament in a design mode heavily influenced by eastern precedents, especially the Chicago School. As compared with typical masonry-bearing wall construction, steel-frame construction allowed for both greater height and greater flexibility in office layout. Thus, these modern buildings could accommodate a wider variety and number of tenants. Distinctive early skyscrapers of similar scale, construction technology and design character – as well as more modest commercial blocks - would be constructed elsewhere in the expanding commercial core over the subsequent ten years, including: the Eitel Building (1906); Northern Bank and Trust Company Building (1906-09); the Central Building (1907); the White Building (1908, destroyed), the Henry Building (1909, destroyed), Cobb Building (1909); and the eighteen-story Hoge Building (1911) and at the far north end of the expanding commercial district the Securities Building (1913). In mid-September 1906 the Seattle PI reported on the shortage of suitable office space in “good” buildings and noted that progress on the completion of the twelve-story American Savings Bank/Empire Building and the new Mehlorn Building would eventually help relieve the situation. In early October 1906 the Seattle PI reported that the Trustee Company had completed the purchase of an entire half block site on Third Avenue between Columbia and Marion Streets, the site of the old First Methodist Church and several smaller commercial and residential buildings. The news story included a fully illustrated rendering of the Central Building (at the “The Central Point”), which the company intended to construct. The architectural plans called for a riveted-steel and concrete structure to be fully clad in terra cotta to be some eighteen (to twenty) stories in overall height including its central clock tower section. The footprint, overall height and size of the building was well beyond any prior commercial project. The article elaborated the planned building’s attributes, including: fireproof and modern construction; all non-combustible materials including interior marble, metal and cement plaster finishes; the most modern steam heating, electric lighting, wiring and ventilation systems and its safety, convenience and durability. The rendering showed that the base and shaft of the building would be twelve stories in height with a five story central stepped tower, three stores of offices with an ornate clock tower rising another two to three stories. The building would house some 750 individual offices served by a bank of seven and spacious lobbies and corridors, and there would be nine stores at street level. Noted well within the text of the article (which was also an advertisement for investors) was the fact that “at the present time only eight stories of this building will be constructed, and the other stories will be added as soon as possible thereafter to supply the demand for offices.” Only four of the seven elevators would be initially installed and there would be only 350 offices with the full building addition to be completed in “a few years as office demand calls for the space.” The cost for the construction of the first eight floors together with the land purchase was anticipated to be $1,500,000. This approach was not unusual as the 12-story American Savings Bank Building/Empire Building had been constructed with the basement and first thee floors being completed prior to the construction of the final nine floors and the 12-story Mehlorn Building was also being constructed in a phased process. Still, the Central Building would provide more office space in one building than any other commercial building previously constructed. The architect for the Central Building was C.R. Aldrich; however, no biographical information has been gathered about him and little is known about his career in Seattle or elsewhere. The Exchange Building component of the Tashiro - Exchange Building (now known as the Tashiro Kaplan Building), also constructed in 1907, is attributed to him. In the summer of 1906,Third Avenue was currently being regraded to have the most gentle grade of any of the retail business streets and property values along the street were said to be 50% that of Second Avenue – the principal retail street. The prospect for future commercial and retail development was further enhanced by the construction of new wider sidewalks and the installation of a modern a street lighting system. The Trustee Company was headed by developers Arthur L. Hawley and Judge W.D. Wood. They promoted this major commercial project with the concept of “unit ownership” in which 1500 “unit-interests” were sold at $1000 each to investors in order to raise capital and cover the cost of construction. Reportedly, a least a half dozen skyscrapers were being planned for other sites along Third Avenue. However, the Trustee Company was only able to assemble sufficient capital to build the initial eight story block. They continued to advertise for investors and promote the project for at least three more years. In early June 1907, the Seattle PI reported on the progress of several modern buildings that were currently under construction in the “business district” including: the “enormous” Central Building on Third Avenue; the Moore Theater and Hotel nearing competition at Second Avenue and Virginia Street; the Chapin Building at the SE corner of Second Avenue and Pike Street the Baillargeon Store Building at Second Avenue and Spring Street, and the “rushed completion” of the first five floors of the Mehlorn Building. The article also noted that the interior work on the top nine floors of the American Savings Bank/Empire Building was proceeding. By June 1907 the concrete foundation was in place and local contractors Gerrick & Gerrick had began to erect the steel frame to be completed by that August. Newspaper stories indicated that lower portions of the building might be completed occupied before completion of the upper floors, due to the demand for office space. By September 1907 the frame was complete and concrete walls with terra cotta cladding were in place at lower levels. From its beginnings the Central Building was considered a civic center due to its “central” location and to the number of civic and official agencies, organizations, libraries and governmental representatives with offices that were housed there, including The Seattle Chamber of Commerce. The phenomenon downtown commercial development that occurred in the early 1900s brought about strong local interest in city planning influenced by the broader City Beautiful movement. During this era, efforts were begun by the Washington State Chapter of the AIA to promote a plan for future development in downtown Seattle. A variety of concepts and proposals focused on the creation of a new civic and governmental center were promoted until the Municipal Plans Commission was created in 1910 and the formal Plan of Seattle – the city’s first comprehensive plan - was prepared by Virgil G. Bogue and completed in 1911. While Bogue was developing a broad scheme for the city’s future development, not too surprisingly, some local city entrepreneurs sought to turn public interest toward proposals that would benefit their interests. One such scheme was put forward by Arthur L. Hawley and W.D. Wood who presented their own design concept for a new downtown civic center. It involved a tiered, ten-block site in the commercial district and along the base of First Hill between Third and Seventh Avenues and bounded to the south by Columbia Street and by Spring Street to the north. The plan called for a formal Beaux Arts civic center with a symmetrical layout; a central open space or mall to be surrounded by eight major structures each occupying a full block. A new city hall, county courthouse, education buildings and a hall of records would be constructed in a formal relationship to two preexisting existing buildings, the Carnegie Library (1903, destroyed) at Fourth Avenue and Spring and the Central Building, which had been developed and promoted by and was partially owned by Mr. Hawley and Mr. Wood. Under this proposal the Central Building would be to be completed and enlarged and a second identical building would be built to duplicate it at the corner of Third Avenue and Spring Street. One of the innovations of the scheme was the proposed construction of a system of underground “subways” and elevators that would inner connect the public spaces and buildings within the civic center and First and Second Avenues. The plan, like several others including the visionary Plan of Seattle, did not materialize. It is not known what specific circumstances may have occurred that the construction of the planned additional upper floor levels was not undertaken. The cost of the anticipated full construction may have proved to be too great in conjunction with the subsequent construction of a significant number of other highrise buildings and large commercial blocks over the following few years, which may have diminished the market for office space. Several other buildings that were constructed during this era with only partially realized original designs, including: the Mehlorn Building; Baillargeon Store Building; Securities Building; the County-City Building (King County Courthouse); Rector/Governor Hotel (St. Charles Hotel) and the YWCA Building. In 1923, an eight-story annex to the building with a public parking garage space was proposed for construction at the NW corner of Fourth and Columbia designed by Schack Young and Myers for James Campbell, Campbell Lumber Company. In 1932, John Graham and Company proposed a substantial remodel and addition that would have attained the original central tower massing concept in a modernistic Art Deco design mode. Neither of these proposals appears to have gone beyond the design stage. It is not known how long the Trustee Company retained ownership of the building. By 1937, the Central Building remained a “Class A” commercial building, housed the offices of New York Life Insurance Company and included at least eight retail stores. In 1961, J.P. Buehl purchased the building. Despite some storefront level alterations the Central Building is a well- preserved example of an important downtown commercial property type that dates from a particularly important period of downtown commercial development. It is a noteworthy example of early highrise commercial design and includes a well preserved and elegant interior lobby space. Located along the entire blockfront on the sloping east side of Third Avenue between Columbia and Marion Streets, this eight-story commercial block was initially designed and intended to be some twenty stories in height with a massive stepped-back central clock tower. It measures 111’ x 240’ with a central bay that is set back at the upper five floors (measuring 18’ x 70’) and exhibits an unusual two-part vertical block façade composition since the planned additional three-part vertical shaft and tower were never completed. The building as constructed incorporates fine Beaux Arts style architectural detailing indicative of the original architectural design and intent. The steel frame and reinforced concrete structure with foundation and basement is entirely clad with gray speckled glazed terra cotta that has the appearance of cut stone. The base encompasses the lower three floor levels and is dominated by a three-story central entrance bay formed by the central setback loggia and capped by a terra cotta balustrade at the third floor level. The building entry is defined by four tapered polished grey granite columns that extend two stories in height. The colonnade is surmounted by a lintel inscribed with “CENTRAL BUILDING” and flanked by shields encircled with leaves and scrolls. Above the prominent three bays of the entrance colonnade are three bays of simple rectangular window openings separated by piers decorated with composite pilasters that are capped by lions’ heads. Portions of the base to each side of the central entrance bay are clad with gray-speckled glazed terra cotta panels formed in a rusticated pattern. The side bays are further divided horizontally by intermediate cornices and bands of leaf moulding that accentuate the third floor level and correspond to configuration of the central bay. The intermediate cornice at the sill of the third floor windows is decorated with small shields and blank plaques surrounded by leaf motif decoration. The cornice above the third floor windows is decorated with larger shields and blank plaques surrounded by leaf motif decoration. The storefront openings correspond vertically with the fenestration and structural pier pattern at the third floor level and shaft above with wider bays divided by ornate terra cotta spandrels that accentuate the retail storefronts and wide mezzanine level window openings. The shaft encompasses the upper five floor levels that form a U-shaped configuration around the loggia below. The shaft is distinguished by smoothly laid terra cotta cladding and regularly spaced rectangular window openings; typically set in pairs on the north and south elevations and in groups of threes on the west façade. The verticality of the shaft is subtly articulated at the corners of each vertical block by slightly projecting window bays with paired and large single window sash members. The shaft is terminated by a heavily denticulated sheet metal cornice. The building has recently undergone a fairly complete rehabilitation project. A modern, non-obtrusive, steel and glass entry canopy has been installed at the central entry bay and most of the storefront level retail facades have been reconstructed with modern infill. The mezzanine level windows appear to be original and some intact original storefronts remain in place at the Marion Street elevation. Upper floor level windows appear to be original double-hung 1/1 sash. The building exhibits a particularly distinctive main lobby embellished with Greco-Roman inspired decorative motifs. 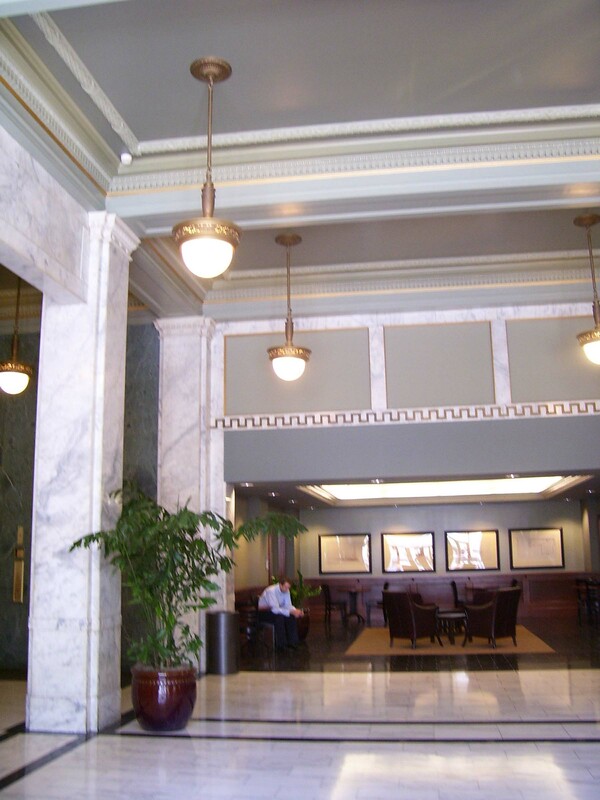 The lobby walls and pillars are entirely clad with a mottled gray marble. Distinctive inlaid bronze Greek meander pattern moulding decorates the marble walls. Other distinctive interior features and finishes include; coffered, ornate plaster ceilings decorated with garlands and dentil moulding, white marble tile flooring with inlaid black marble patterns and green marble panels at the elevator bays. Ceiling coves and column caps include egg-and-dart mouldings. The symmetrical formal lobby plan is accentuated by open flared marble-clad stairwells with wide curved marble banisters and newel posts located to each side of the lobby space. Ornate – possibly retrofitted original - pendant light fixtures that are decorated with Roman cross motifs are in place in the main lobby. Modern entry doors and finishes are in place at the front of the lobby and a modern alcove is located at the east end of the lobby. With the exception of the main original lobby there do not appear to be any other intact or architecturally significant interior building features, finishes or public spaces. 'Trustee Company Completes Purchase of Half Block on Third Avenue for Building Site" Seattle P.I., October 7, 1906, pg.9. 'The Central Office Building as it is to be constructed now…" Seattle P.I., November 11, 1906, pg.10. "Steel Frame of Structure begun on Central Building" Seattle P.I., June 9, 1907, pg.10.